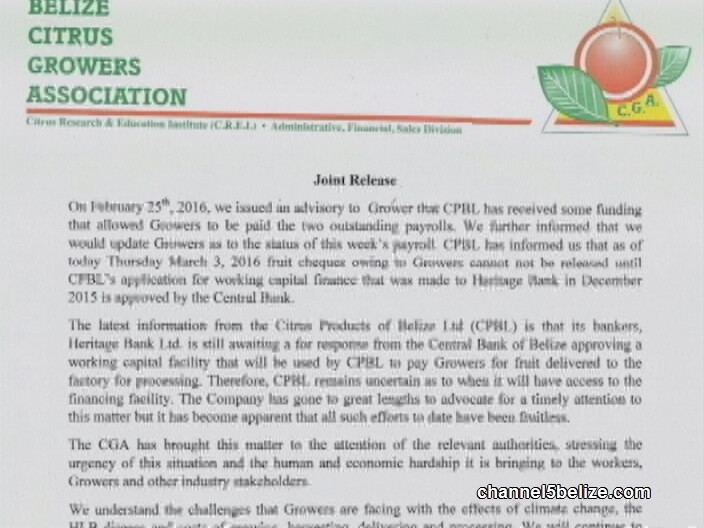 There is brewing concern in the citrus industry tonight after growers were informed via a Citrus Growers Association release that payroll in the immediate future is uncertain. Here’s the situation as we understand it. 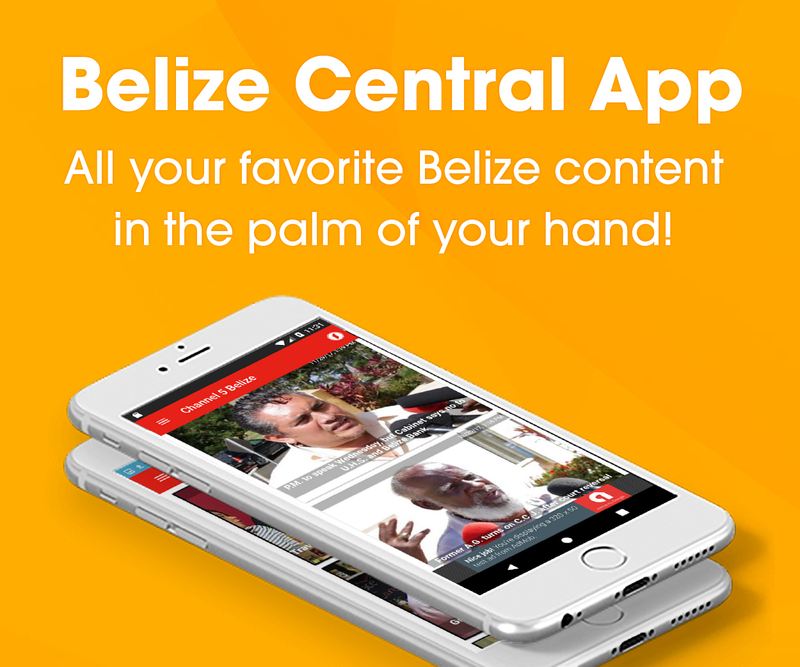 Every year during crop season Citrus Products of Belize Limited, CPBL, engages in short term capital financing. 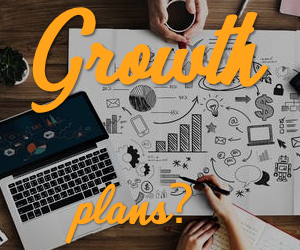 That financing is used to pay growers sixty percent up front for delivery of produce, since CPBL doesn’t get any revenues until the juice is processed and sold around July. You may recall that in 2014, G.O.B. advanced four million to help with crop financing, and in 2015, two million. This season, the CPBL didn’t go to G.O.B., but went to Heritage Bank instead for a ten million dollar facility to be repaid in August. According to sources in the CPBL, Heritage Bank has approved the loan, but is waiting for clearance from Central Bank – since we are told Central Bank has to approve any loan over three point five million dollars. So that’s where we are at this point. 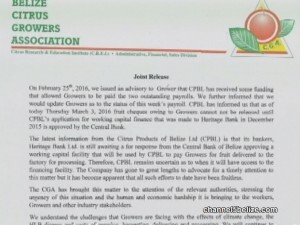 The CGA release issued today states that, “the latest information from the Citrus Products of Belize Limited is that its bankers, Heritage Bank Limited, is still awaiting a response from the Central Bank of Belize approving a working capital facility which will be used by CPBL to pay growers for fruit delivered to the factory for processing.” The release further claims that, “the CGA has brought this matter to the attention of the relevant authorities, stressing the urgency of the situation and the human and economic hardship it is bringing to the workers, growers and other industry stakeholders.” The CGA ends by assuring growers that it will continue to advocate for a resolution to the matter to prevent further irrevocable damage to the citrus industry. We contacted Governor of the Central Bank Glen Ysaguirre this evening. He declined comment, and told us via text that he could not speak on it because the Central Bank deals directly with the banks and not with the stakeholder companies involved.